Windows Tutorials, Howtos, and More! : How to keep files across multiple computers in sync! How to keep files across multiple computers in sync! 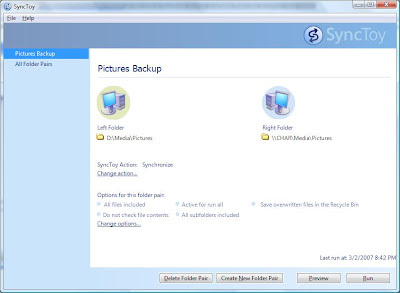 Microsoft SyncToy is a PowerToy for Windows XP and Vista that allows you to keep folders in sync! They can be on the same drive, on different drives, or even on different computers! Click "Read more!" to see how! 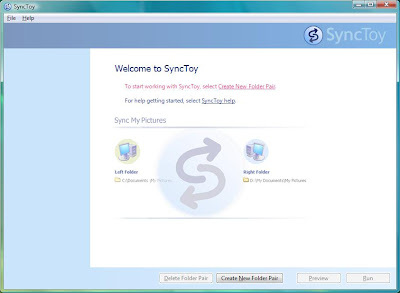 To begin, you must download Microsoft SyncToy and install it. At first run, it displays the following screen. Press the "Create New Folder Pair" button on the bottom. A window will pop up asking for a "Left" folder and a "Right" folder. 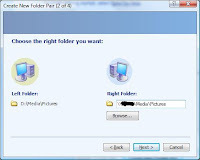 If synchronizing between two computers, put the local folder in the "Left" folder and the remote folder as the "Right" folder. The next step asks which type of synchronization you would like. Read the short description and select which you would like. If you want to keep a folder that will be modified on both computers, the first option is the best. The last step asks for the folder pair name. Create a name and click "Finish". You may now create new pairs, preview the synchronization, or run the synchronization.